Though barely mid-day, a change in the wind brought a sudden chill to the atmosphere. Gazing upwards, I noted the sky had darkened considerably, imposing a curious sense of impending doom on the three of us as we trundled along. Not for the first time, I began to wonder if we’d made an error of judgement. Ahead, the road divided into two, and as if warning that to go any further would be to our disadvantage, a wooden crucifix reared up like a stick-man silhouetted against the sky. As we drew closer, I realised it was signpost. Bearing the legend ‘East Protor’, the crosspiece hung limply, the whole thing leaning at a precarious angle amid a tangle of purple heather. “This be as far as Oi go, sor,” muttered our driver, pulling the horse to a standstill. We had reached the brow of a hill. Looking down across the fells I perceived what appeared to be a village. On closer inspection I surmised it to be nothing more than a handful of weather-worn buildings huddled together like a group of surly shepherds, pitting their wits against the oncoming rain. “What the devil d’you mean?” barked Holmes, giving the old man a thump on the shoulder. Gazing up at the greying sky, a few drops of rain splashed against my cheek. Recalling something Doctor Hirsch had told us, I peered at an object sticking out from the closest of the stone buildings. The faint squeak of a hanging sign, creaking against its hinges told me all I needed to know. “Well, I don’t know about you, Holmes,” I said, “but I’m all for popping down to the pub for a pint of Old Peculiar, or whatever passes for a decent drink out here. I’m sure the locals will be only too happy to regale us with tales of werewolves and the like.” I began to clamber down from the trap and after a moment, Holmes followed suit. The old man grunted but said nothing more. The road we were on now split in two – one running off to the left towards the woodland, and the other, a rough farm track, sloping down over the fells in a wide arc that took it past the nearest of the buildings. The pub. “Your round,” I chirped, striding off down the track. A few minutes later we had reached the inn. Sliding out of my Mackintosh, I gave it a shake and was all for barging straight through the door, but Holmes held me back. “Have a care, Watson,” he said, his chin angled upwards. “I know what you’re thinking, Watson, but this is simply a public house that just happens to have the same moniker as that den of iniquity we encountered in the adventure of the…the er…” He clicked his fingers irritably. “The Wicker Mannie,” I said, helpfully. And with that he grasped the iron knob, gave it a firm twist and walked inside. I looked up at the inn sign again and winced at the gory image. 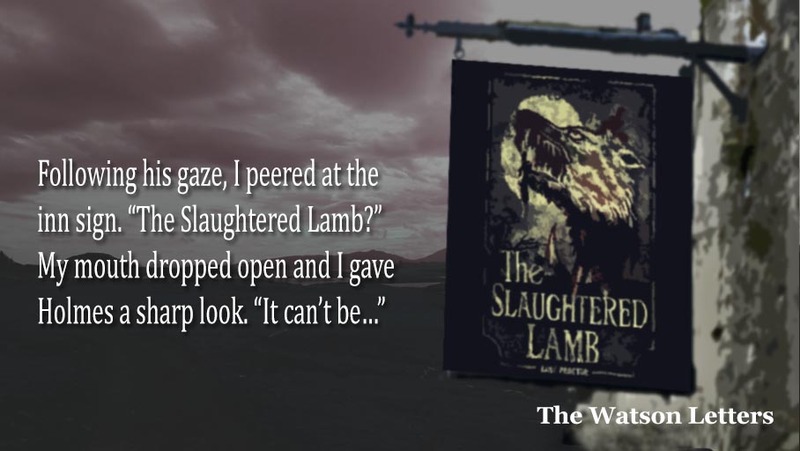 It depicted a severed sheep’s head with blood dripping from the jagged wound. I swallowed hard and went into the pub. Very exciting, Colin. The sheep’s head at the end is very creepy. narsty dangling participle you have there guvnor; with a few raindrops looking up into the sky. Dangling participles? Hah – I eat ’em for breakfast! Yes, I believe I have had some of that. Funny shaped bottles, if I remember correctly, and strong stuff. I attended a rugby coaching course at Bisham Abbey (1980) and the English coaches had stocked up on Theakston’s. Good stuff.